As an initiative of the United Nations Environment Programme (UNEP), Environment Day ('WED') is celebrated on 5th June every year. To raise global awareness about the need and importance of having a positive attitude towards environment, various programmes are being arranged by organizations and institutions. 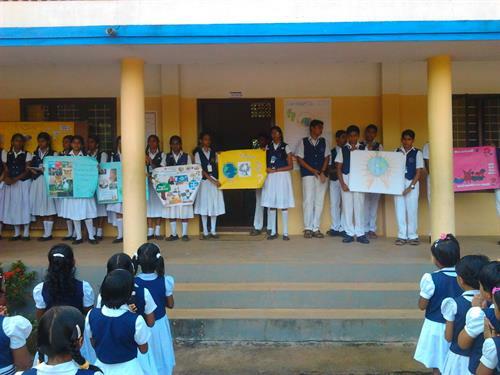 To make the students conscious about the environment and to create a love towards the nature, a series of events were instigated by St.Mary's Public School Puthupally, an educational institution which is well-known for its home friendly atmosphere. The school which gives much importance to academics takes much care in organizing a number of activities according to the instructions given by the CBSE education board. Added to it, with an aim to improve the overall personality of each student, the school initiates a number of innovative programmes which are given at heavenly dose. On 5th June 2013 marked the beginning of observation of world environment week in the school which left space for a series of activities which was to be followed in the coming days. As a part of the initiative, students took part in various programmes which was conducted as a part of the Environment day. After the Environment Quiz, competitions like Speech on Conservation of Environment, Essay Writing, Poster designing and preparing Photo Magazine would be conducted on 6th and 7th June as per plans. The day greeted the students with beautiful posters and thought provoking quotes prepared by students of Std. VII of the school. A special assembly was organized for the day, making students aware about the importance of conservation of the environment. Started with a prayer by school choir, the school principal smt. Mariamma T.C gave a magnetic speech flavoured with a message to protect the environment. Students took an oath to keep the school campus clean. The students shared their happiness of having organizing such a day which alert them to keep the environment clean for the generation next. "I am extremely happy to be a part of this school which is blessed with gifted teachers and students who carry novel ideas which could support our daily studies and empowering us to have fruitful dreams about our future too. As usual I made my presence by lively participating in the poster designing competition related to environment organized by the school." said Surabhi Surendaran of Std. VIII. Sneha Susan of Std IX had something more to say about the Environment week. "Yes, I and my friends were eagerly waiting for the day. Comparing with the activities that we have done in the past, this year we are having a long line of programmes. It was great to see the posters on environment designed by our juniors. We are also on the way organizing a creative poster which could give an insight to all about the need of protecting our environment. After the 'Enviro Quiz', I am looking forward to participate in the contests like speech on Conservation of Environment, essay writing and preparing Photo Magazine which are being planned for the next days". The school manager Fr.Joseph Mathew shared his thoughts on this special occasion. "We want our students to be much conscious about the need to realize their responsibility but also want them to be become agents for change ensuring a cleaner, greener and brighter attitude for themselves and upcoming generations. The participation of all students is different activities are being ensured. 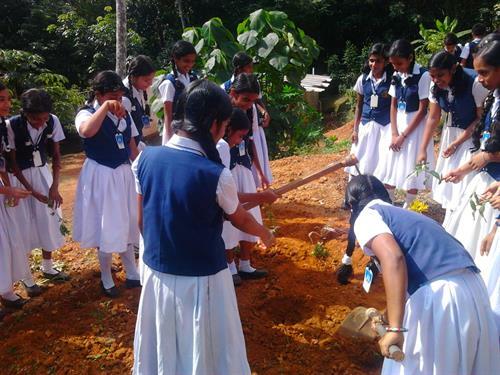 Students have given their support by planting saplings in the school campus which was done to make sure that they keep the nature close to their heart. We will be distributing plantlets to every student". said Fr.Joseph Mathew. The school is looking forward for various activities which are being planned to instill social awareness among students.